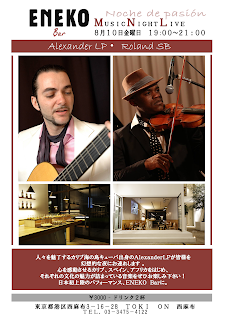 & Roland SB will take you with its Latin rhythms to enjoy and feel a night of glamor. A bolero that moves the heart, a rumba that will make you dance, a cha-cha-cha that will make you feel the infinite joy that is lived in the largest of the Caribbean islands. Havana Social Club is the divine wealth of various cultures, Spain and Africa. A unique and exclusive concert in all of Japan.